It represents mankind being tied together through goodwill.The gift bow on Christmas gifts symbolizes unity. Ribbons come in many colors, but all can be woven together to create a bow. Through our Ribbons to Bows project, we call on people from all over the world to come together in unity to form a Radiant Bow. The radiance symbolizes God’s light shining brightly on our unity bow. With His help, we offer the gift of hope to those in need. At this time, our project focuses on the people of Yonna Village, Gambia. The Gambia, a tiny country on the west coast of Africa follows the Gambian River. Surrounded on three sides by the country of Senegal, it boasts beautiful beaches on its West coastline. 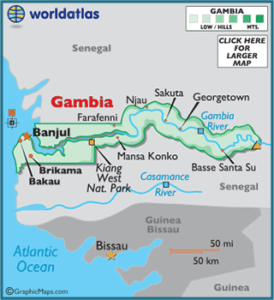 While the Gambia only recently became a sovereign country, celebrating its independence on February 18, 1965, it hosts a long, rich history dating back to the 9th century, and perhaps even before. Like many countries in Africa, Gambia struggles with third world issues and finding its place in today’s world. Many of Africa’s poor will search for sponsors for food or school. Saikou was different. He did talk of hoping to get money to have his sister attend school. But mostly he talked about his dreams for the future. He hoped to have a small farm, to ensure his family no longer went hungry. He wanted a better life for his sister and his mother, now a widow. And from those early conversations on an often unreliable internet using a very old cell phone, the idea for Ribbons to Bows, the Radiant Bow project emerged. What Radiant Bows? How will it impact Yonna Village? In my friendship with Saikou and his village, I discovered people blessed with talents. Saikou is a writer; his sister’s talents are in the field of art. While these might be mere hobbies, they offer a way for new Ribbons to come together to create bows. These new radiant bows will help the new Yonna Christian School and further education, too. Supporting Yonna Christian School. A new school this year, YCS has a total of 51 students and 3 teachers. Using the church building for the schoolroom, the Pastor and Saikou have arranged to have classes meet on two schedules to allow the 51 to attend. Students are given their books and materials and are provided with a meal during school time. For many, this meal of beans and rice is their only full meal. In addition to all the academic subjects, they receive instruction in Bible from a Christian perspective. The teachers hold high expectations from each student. The school is free, but the students must study diligently. All are expected to pass their tests and to graduate from grade 12, when ready. Begin gathering books for the school’s students to enjoy. These will become the school library and will be open to all those in the village, including parents and others. Building on to the school. Currently, the school has two grades, 7th and 10th. That worked best for those attending this year. However, next year, 8th grade and 11th grade will need to be added. The current plans include holding classes for 7th through 11th grade next year with 12th being added the following year. In future years, lower grades will also be added. Adding vocational training. The necessity of education cannot be set aside. However, students need training for jobs after high school, too. Provide funds for some students to attend college. While some will choose agriculture and other vocations after high school, some students hope for college. And above all, you are helping some very worthy, needy people to be able to work their way out of poverty.